When Lochan Das arrived in Amedpur, he was unable to remember where his in-lows house was, since it had been so long since he had visited. He asked a young girl in the street for directions, addressing her as ‘mā’, or ‘mother’. When he arrived at his in-laws’ house, he found out that the girl whom he had addressed as his mother was in fact his wife. From that day on, he always looked upon his wife as a mother, worshiping Guru and Gauranga in an attitude of renunciation. Lochan Das Ṭhākura appeared in 1523 in Kogram, in the Katwa block of Burdwan district. This village is about ten miles north of Guskarā train station. The Ṭhākura’s home is situated near the Ajaya River. His birth tithi is given by some as the first day of the fortnight of the waxing moon in Paush. He was born in the Rarha clan of the physician caste (vaidya). His father’s name was Kamalakar Das, his mother’s Sadanandī. He was a very affectionate and lone child of the couple. Lochan Das studied while at his maternal grandfather’s house. He displayed devotion for Mahāprabhu from his childhood. Lochan Das was married at a very young age, according to the customs of that time. Since he had been married so young, his wife first remained with her parents in the village of Amedpur Kakuta. As he grew older, Lochan Das showed a highly renounced attitude to life and spent all his time discussing Kṛṣṇa-kathā with other devotees of Gauranga. As the time approached when his wife was to join him, the girl’s parents began to worry because of Lochan Das’ indifference to material life. 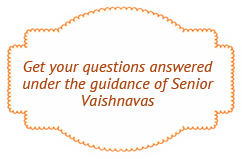 They approached his guru Narahari Sarkar and told him of their disquiet. As a result, Narahari Sarkar ordered Lochan Das to go to his in-laws’ home. When Lochan Das arrived in Amedpur, he was unable to remember where their house was, since it had been so long since he had visited. He asked a young girl in the street for directions, addressing her as ‘mā’, or ‘mother’. When he arrived at his in-laws’ house, he found out that the girl whom he had addressed as his mother was in fact his wife. From that day on, he always looked upon his wife as a mother, worshiping Guru and Gauranga in an attitude of renunciation. Narahari Sarakar Ṭhākura, Mahāprabhu’s famous associate from Srikhanda, was very affectionate to Lochan Das and gave him initiation. Lochan Das Ṭhākura enthusiastically took up residence with his guru in Srikhanda and served him. His guru taught him about kirtan and later ordered him to write Mahāprabhu’s sacred biography. Lochan Das took this order seriously and wrote the Chaitanya Maṅgala, the events of which are based on Murari Gupta’s Chaitanya-carita. I attentively pay my obeisances to Vrindavan Das Ṭhākura; his Bhagavata’s songs have enchanted the entire universe. Narahari Das Ṭhākura is the proprietor of my life, and out of the hope of attaining his lotus feet, I desire to sing the glories of Gauranga, even though I am the lowest of the low. This is my ambition. I offer my reverences to Narahari Das, the ocean of Gauranga’s qualities. Other than him, I have no friend in the three worlds. My lord and master is Narahari Das. I prostrate myself in humility to him. May he fulfill my desires. Lochan Das Ṭhākura wrote the Chaitanya Maṅgala in Eastern Bengal’s Pañcālī style, completing it in 1537 AD. There is a legend that he wrote the book while sitting on a stone under a flower tree. In his new Bengali dictionary, Ashutosh Deb has underlined Lochan Das’ contribution by stating that he was the first to write Bengali poetry using vowel-marked meters as well as being one of Bengal’s earliest historical writers. The original manuscript of the Chaitanya Maṅgala is said to be found in the personal library of Prana Krishna Chakravarti of Kandra near the the Guskara train station. Other titles attributed to Lochan Dās are Prārthanā, Durlabha-sāra, Padāvalī (Dhāmālī), and Bengali verse translations of Ramananda’s Jagannāth-vallabha-nāṭaka and the Rāsa-pañcādhyāya of Srimad Bhagavatam. In Chaitanya Maṅgala, Lochan Das Ṭhākura describes his guru Narahari Sarkar Ṭhākura as Mahāprabhu’s dearest associate. He does not describe Nityananda Prabhu’s glories as extensively. Fearful that he may have committed an offense by neglecting Nityananda Prabhu, he later wrote a few songs in His praise. These songs are particularly well appreciated by the devotees. Nitai is a jewel of virtue! My Nitai is a jewel of virtue. He brought the deluge of love of God and flooded the world. Nitai brought the deluge of love of God to Gauda Desha and inundated the devotees. The lowly and deprived floated in the flood. Nitai never excluded the lowly and deprived, nor the sinful and atheistic. He freely distributed the love of God, which is beyond the reach of even Brahma. Nitai released the floodgates that held back the ocean of compassion, going from door to door to give everyone the nectar of love. Lochan Das says that anyone who has not worshiped Nitai has knowingly committed suicide. Completely free from anger, Lord Nityananda Prabhu is the embodiment of supreme joy. He wanders throughout the town without any pride or arrogance. He knocks on every fallen soul’s door and bestows the Maha-mantra of the Holy Names on him. Saying thus, He tumbles on the ground, in an ecstatic fit, looking like a golden mountain rolling in the dust. Whoever lacks faith in such a compassionate avatāra is a sinner who will die having made nothing of his life, says Lochan Das. 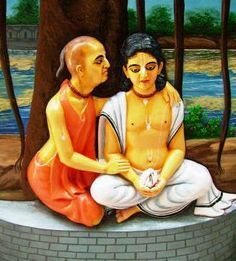 These two lords, Nitai and Gaurachandra, are most compassionate. They are the essence of all other avatāras of Godhead, They are the most perfect, for They are the unique source of joy. Pray, O brothers! Pray with great faith to Chaitanya and Nitai. Give up the objects of sense-gratification, absorb yourself in the flavors of Their divine mood, and use your tongue to sing the names of Hari. Just look, O my brothers! There is no more compassionate benefactor than Gaura-Nitai anywhere in the three worlds. Even the birds’ and beasts’ shed tears in ecstacy and stones melt when they hear Their virtues. I have fallen into the worldly life, completely absorbed in mundane pursuits, and have never aspired to attaining Them. The god of judgement is making me suffer the consequences of my acts, so sings Lochan Das. Śrīla Lochan Das Ṭhākura was present on the occasion of Śrī Narahari Sarkar Ṭhākura’s disappearance festival. In Bhakti-ratnakara, it is said that he came there with Yadunandan Ṭhākura, bringing garlands of flowers and sweet-scented sandalwood. Lochan Das Ṭhākura ended his pastimes in this world in 1589 AD. His brick samadhi is seen at his Sripat.